The lowest cost of ownership for any full-feature Salon POS System on the market. Get started free or compare prices so you know you’re getting the best deal. Plus 30 day trial period! 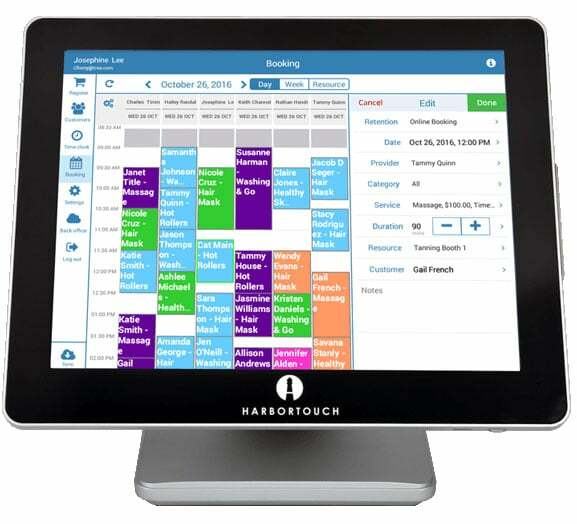 Harbortouch Salon & Spa point of sale system offers powerful features that works with a wide range of health and beauty businesses, including hair salons, nail salons, spas, barbershops, gyms, fitness clubs, beauty schools, massage parlors, pet grooming, tattoo parlors and much more. Yes! We provide a free URL that allows customers to book appointments online or from mobile devices. Most other online systems cost money and charge per user and this can add up quickly. Our online booking system is integrated directly into the POS software and completely free. Can Stylists View Their Schedules Online? Yes, stylists can view their schedules online and on their mobile phone; if a stylist is out for any reason they can transfer appointments to another stylist. Is Programming, Installation, and Training Included? Yes, yes, and yes. 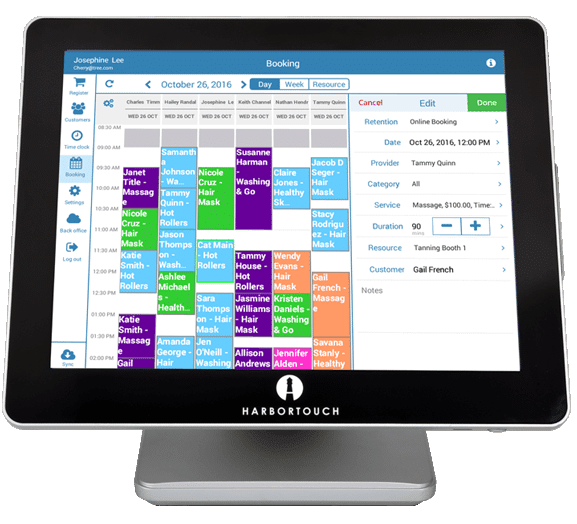 Harbortouch will not only program the Salon POS software and install the hardware for you at no charge, but will also spend one (1) hour after the install doing one-on-one training in person at no added cost! Does This System Work with Booth Rental? If you want to expand your business in the future and need a loan, a multi-merchant can not be claimed as income, and you may not qualify. Our salon POS software provides detailed reporting, appointment settings on the POS terminal and online, customer retention, customer management features, and provides you with a pulse on your business; a credit card terminal cannot do this. If you want to sell your business in the future, you’ll want reliable point-of-sale records that can prove the value of your business. Most importantly, you’ll save in credit card processing fees by eliminating the overhead on the multiple merchant accountants and reduce the redundant fees charged to all the stylists. Yes. Salon and Spa is a complete package and is a fully integrated POS solution (salon software, hardware, and credit card processing). Is it EMV Ready Now? Yes, our salon POS system is fully PCI compliant and EMV ready now. Included is a Pax SP30 PP credit card terminal for EMV (chip-and-pin). Counter tip is also included so the stylist can avoid the awkward tip conversation. The card terminal prompts the customer to leave a tip during the checkout process. 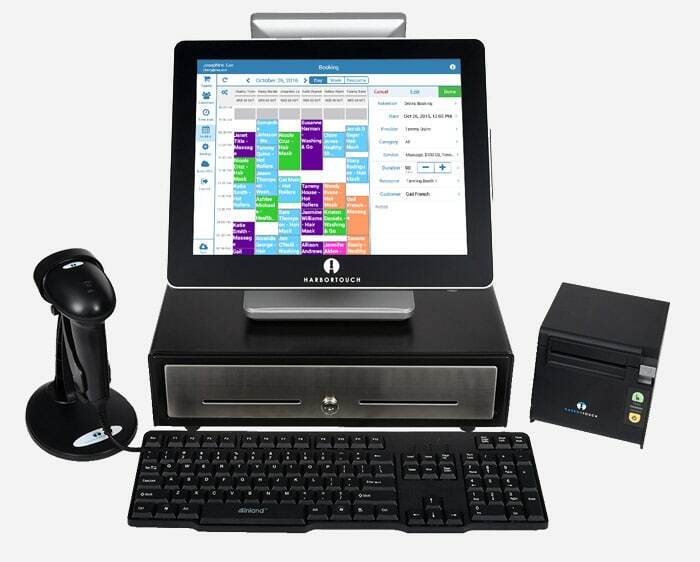 Harbortouch Salon & Spa is the first free POS system designed specifically for the salon and spa industry. Our complete salon and spa POS system includes everything you need with salon software and POS hardware for one flat monthly fee and no up-front costs. Appointment management for both walk-in customers and scheduled appointments for all your service providers with an easy-to-use interface. Includes email and text reminders so your customers know of upcoming appointments. Our salon POS software includes a customer database so all of your client information is organized with appointments, notes, preferences, and photos of previous hair styles. Quickly find available service providers and manage walk-ins. Customers can choose to wait for the service provider they always use. Not only is this the best salon POS system on the market, but the HT salon and spa software system is programmed with features and functionality so you can sell all of your products. You can assign appointments to any specified chair or booth for tracking multi-stations with our salon pos software. Managing your service providers has never been easier with detailed labor reports and commission tracking. *All free equipment programs require a Merchant Transaction Processing Agreement. Additionally, the free salon POS system program requires Harbortouch POS System Service Agreement. See Processing Agreement and Service Agreement terms and conditions for complete details. **Shipping charges apply. Equipment malfunction must be as a result of normal usage. Harbortouch Merchant Account must be in good standing to qualify. See Service Agreement terms and conditions for complete details.